HTC might have unleashed a new Sense UI for its high-end handsets; but owners of incumbent phones might miss out on the functionality. HTC's new Sense UI works in tandem with HTCSense.com, which means cloud syncing of contacts and messages, phone recovery tools and easy remote interaction with your phone. The new Sense UI also offers improved mapping abilities, DLNA support and Facebook face tagging of photos before uploading. However, HTC Executive director Jon French has stated that it is 'looking at other handsets' when it comes to porting the new UI to older devices. "[Sense UI] depends on a technical standard, where it has to support the new services offered by HTCSense.com. "We're launching that on the Desire HD and Desire Z, and it could be that we roll it out to other devices later on." 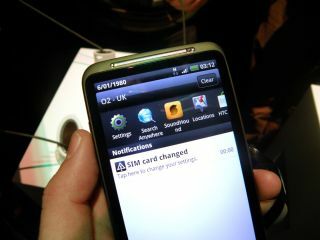 He did also confirm that only Android 2.2 could support the online synchronisation HTC unveiled today, but given that the HTC Desire has already been given that upgrade, it's hard to see where that phone is lacking – so fingers crossed HTC works out how to keep older customers happy too.